Home » Soups » Roasted Butternut Squash Soup: Simply the Best! We had an abundance of pears in the house last week-end, and most of them went towards trying different flavor combinations for this Crock pot Vanilla Pear Butter Recipe. But I did manage to hang on to the few pears that I needed to make this, one of my favorite pear soup recipes. So this Roasted Butternut Squash Ginger Pear Soup starts with preheating your oven to 400° F. Cut your butternut squash in half. Remove the seeds and strings and set them aside for just a moment. Drizzle the cut side with about two tablespoons of olive oil and season with salt and pepper. 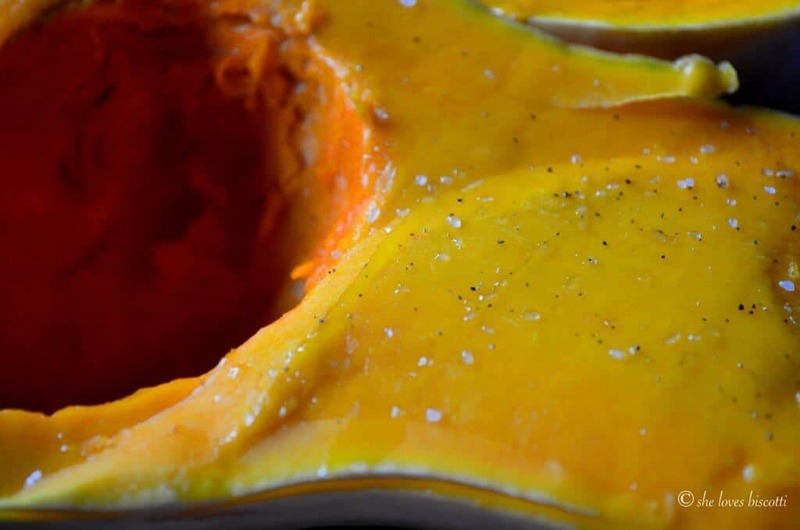 Place your seasoned squash cut-side down on a baking sheet lined with parchment paper. Bake between 45-60 minutes or until you can easily slice through the pulp with a knife. 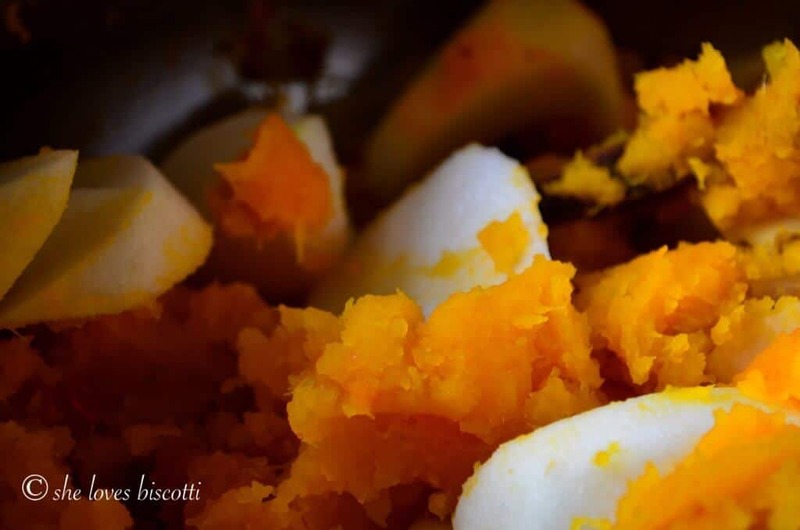 Did you know that the seeds of a butternut squash are edible? 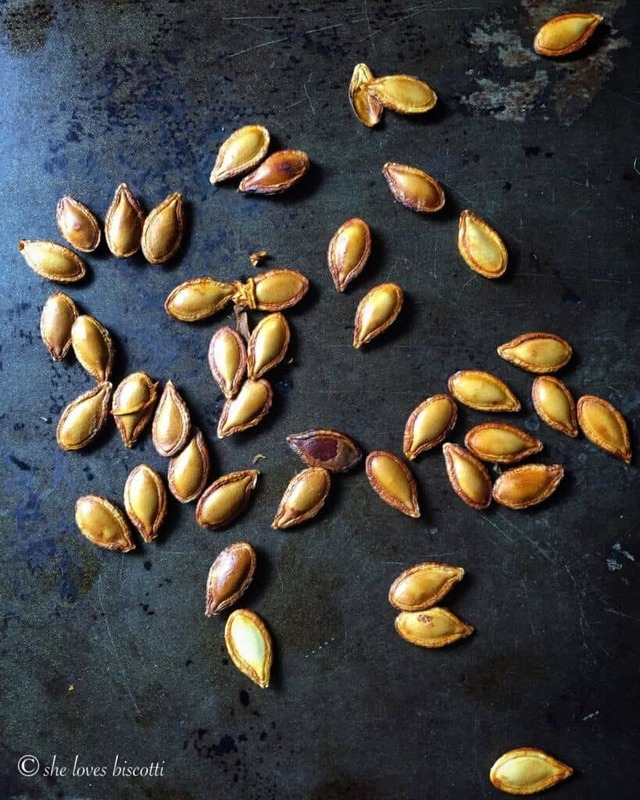 Just like this recipe for Slow Roasted Pumpkin Seeds, they make a healthy little snack. I also like to use them as a garnish for this Roasted Butternut Squash Ginger Pear Soup. While the squash is baking, detach the seeds from the strings, give them a rinse and pat them dry. Once you remove the squash from the oven, set it aside to cool. I then place the seeds on the same parchment lined baking sheet and bake for a couple of minutes until nice and roasted. Place a thick bottomed pot over medium-high heat. Add 2 tablespoons of olive oil, and sauté some onions, stirring frequently for about 5 minutes. When the onions have softened, add grated ginger and sauté for another minute or so. Then add chicken stock (or vegetable stock if you’d like to make this a vegetarian dish), squash, chopped pears, and bay leaf. 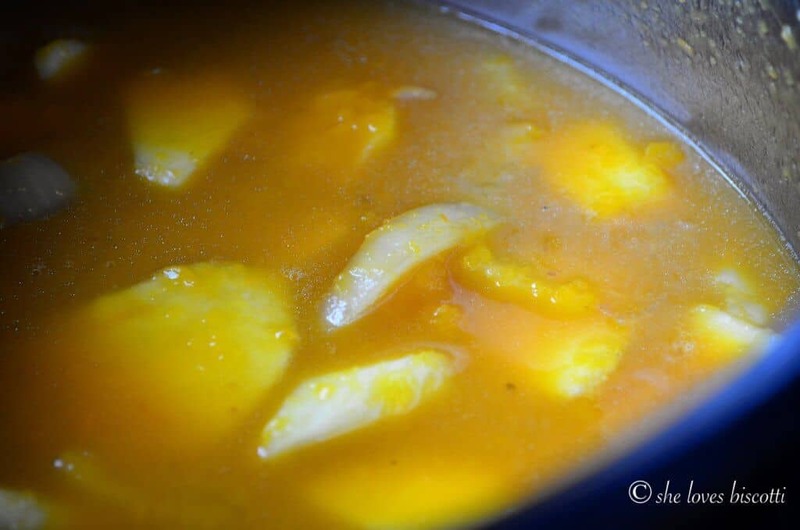 Combine together and bring to a low simmer for about 10-15 minutes. Now it’s time to puree the soup with a hand held immersion blender (alternatively, you can use a food processor). Don’t forget to remove the bay leaf! Adjust your seasonings and that’s it! The original recipe is from one of my favorite cooks, Dave Lieberman. If interested, the original recipe can be found on the food network. As usual, I’ve adapted this soup to suit my own preferences. I roasted the squash in the oven; I substituted the rosemary with a bay leaf and ginger. In order to reduce the amount of saturated fats, I replaced the butter with extra virgin olive oil and eliminated the cream. The velvety smoothness of this dairy free Roasted Butternut Squash Ginger Pear Soup is attained with only healthy ingredients. The perfect soup for those inevitable cooler evenings. 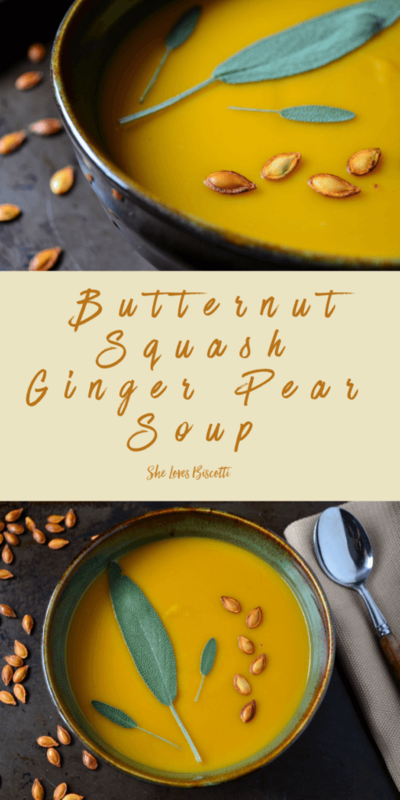 ★★★★★ If you have made this Butternut Squash Pear Soup recipe, I would love to hear about it in the comments below and be sure to rate the recipe! Cut squash in half; remove the seeds and strings. Set aside. Drizzle the cut side with about 2 tablespoons of olive oil; season with salt and pepper. Remove from oven and set aside to slightly cool off. Place the seeds on the same parchment lined baking sheet and bake for a couple of minutes until nice and roasted. Place a thick bottomed pot over medium-high heat. Add 2 tablespoons of olive oil, and sauté the onion, stirring frequently for about 5 minutes or until the onions begin to soften. Add the grated ginger root and sauté for another minute or so. Add the stock, squash, chopped pears, and bay leaf. Garnish with seeds and sage leaves. 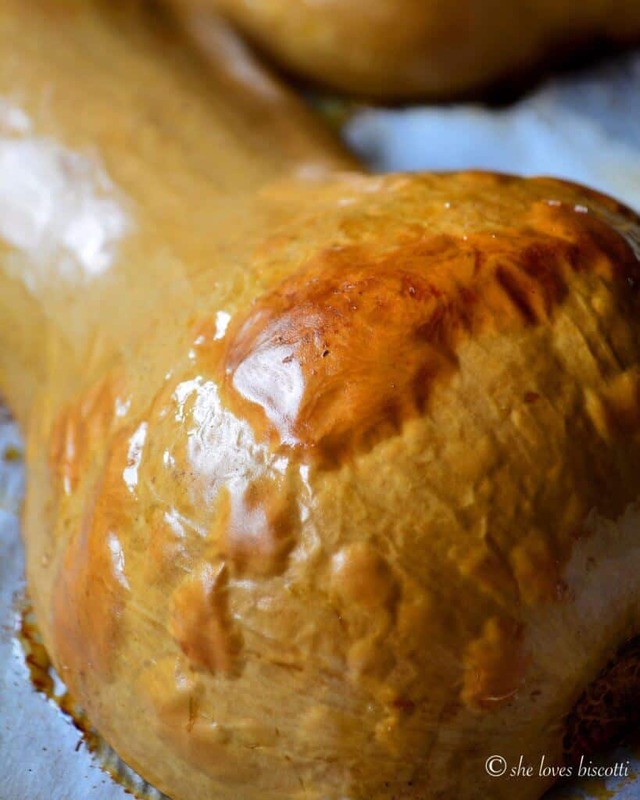 Can you substitute pumpkin for the Butternut squash? If so, does a wee bit of sugar need to be added as pumpkin isn’t as sweet as butternut? I have squash and pears in my fridge! This will be on tap for supper! I love the idea of using pear instead of apple in this soup. Such a delicate flavour and it would meld so well. My wife made about the same soup without the pears today! It was simply marvelous! I’m really curious at the pear in it! It sounds strange but it wouldn’t be the first time something strange is delicious! That is a gorgeous bowl of soup, Maria! The color is wonderful and I can just see the beautiful texture. And the flavor…mmmm. Wonderful, comfort food for when the temperatures are slowly going down. We’re still in Italy and while the temperatures have cooled off a bit, we’re still around the 25° C 🙂 . Pinned it in my soup recipe board! What a beautiful bowl of soup! Gorgeous photo! I love the flavour combination. I make a similar soup with pear (or apple) and curry. I think I will try your recipe though, it looks amazing. Thanks Laura, hope you enjoy it! Love the combination of pear and curry also …so many soups …so little time 🙂 Thanks for dropping by. Yum! Love this combo and that you used all of the squash! Those squash seeds scream Fall. This sounds so flavourful–with a hint of sweetness from the pear and a zip from the ginger! Total comfort food!